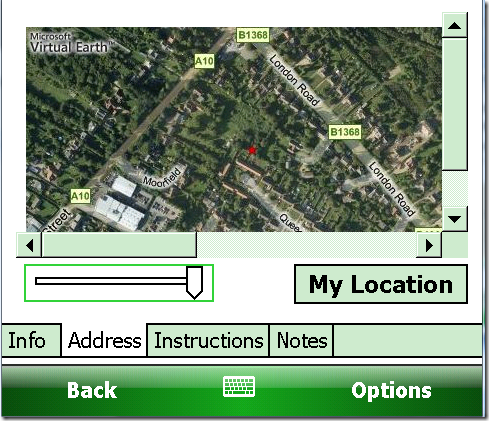 I’m back developing a fair few prototype Windows Mobile applications. I’ve just put together a small field service application that I needed to add some bells-and-whistles to. What better for the field engineer but to have maps available. 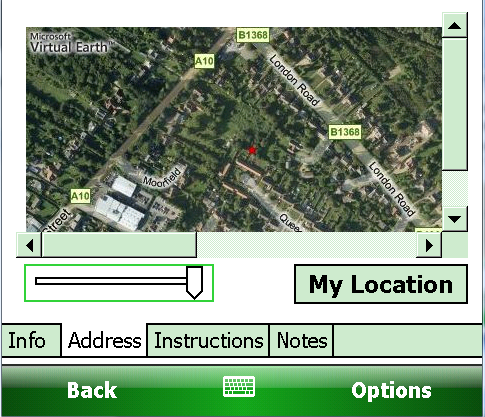 I wanted to have my map displayed right inside of a Compact Framework form. A really well kept secret is that you can use Virtual Earth as a tile server to give you nice optimised for mobile map images. Now their are licence implications for doing this, and to the letter of the law you have to have a Microsoft MapPont.Net licence. It is composed of the longitude and latitude (in decimal format) for the centre of your map and you can even specify and overlaid pin. Finally you can specify the size of your map and zoom level. I then simply put a web-browser control on the form and navigate to the URL produced from the above method.